This post is brought to you by The New Santa Fe from Hyundai. the waterfalls. The only problem is it can be a little tricky to get there. But I’ve found some of the best places I’ve ever been to are hard to get to. It is a 5 hour drive to the rim from Las Vegas or Phoenix. 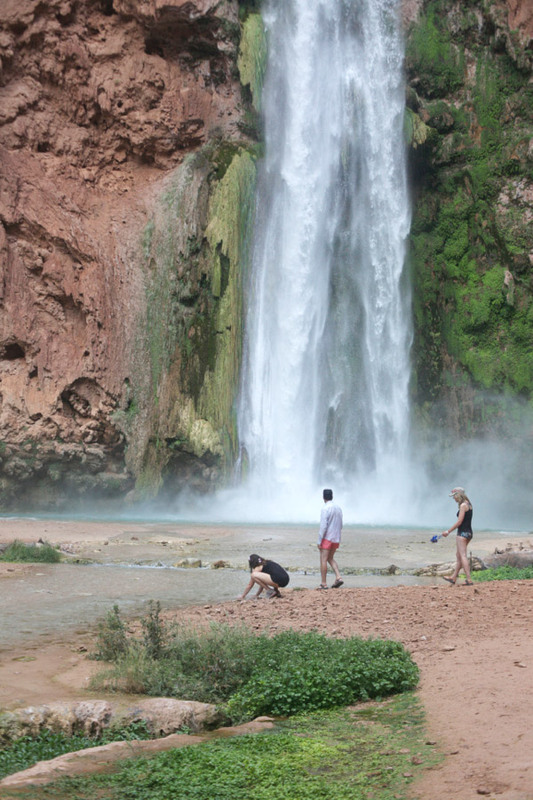 Then once you are at the rim you can hike in 10 miles, or for an $85 fee helicopter in to Supai, the village. 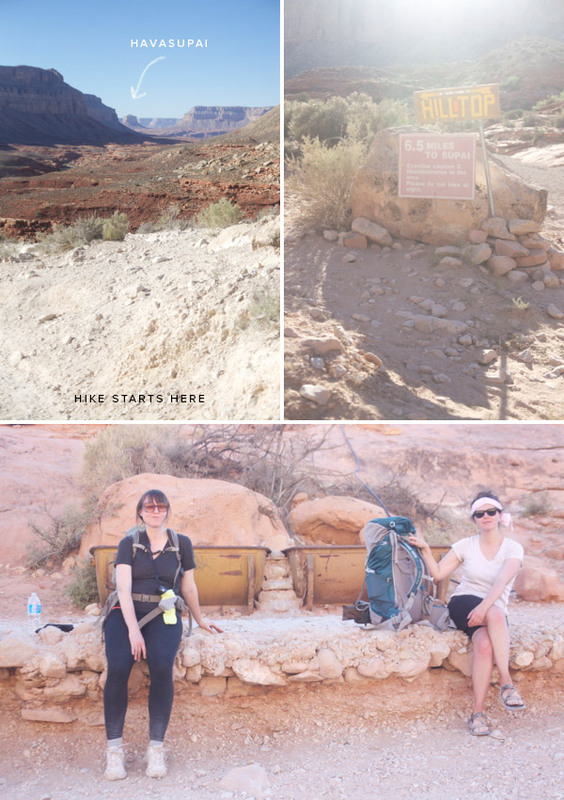 Then from Supai it is still another 2 miles (in addition to the 10 you just hiked) to get to the campground area. There are other options too where you can travel by horseback or even just have the helicopters or donkeys carry your packs for you while you hike. We decided to hike in with packs. The biggest challenge of the hike is staying out of the heat. Most people start the hike at 5 am to avoid most of the hot daylight hours. We arrived in the afternoon but decided to wait until 4 pm so we would hike for a couple hot hours and then we would be in the shade of the canyon. It was hot! I grew up in the desert but I forgot how hot it can get. Once we had descended into the canyon there was shade and it wasn’t as bad. If I did it again I would consider helicoptering in or having my pack taken in for me. 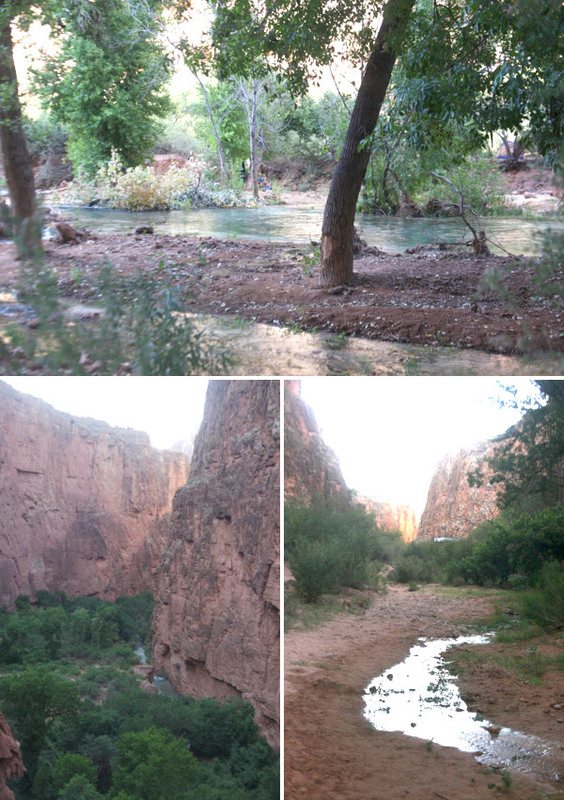 My reasoning is that it took us about a day to recover from the big hike and since we only had a few days in the canyon we would have had more time to explore and hike than take it easy swimming. Once you get to the canyon everything is green and there is lots of shade. The campgrounds are in the shady areas near the river. 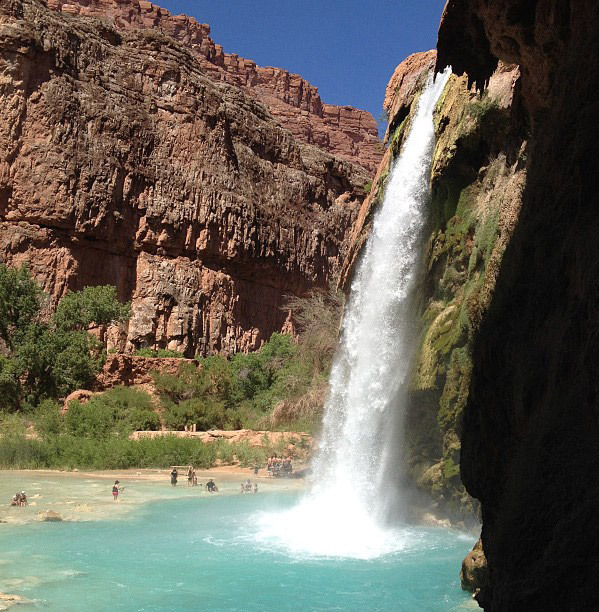 The main falls are called Havasu Falls and they have great swimming pools at the bottom. These falls are the closest to the village and campground and are the busiest. 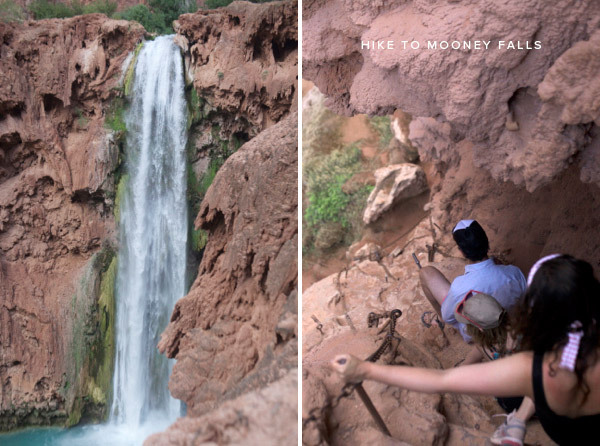 A short hike beyond the campgrounds is Mooney Falls. These falls are require some hiking down with chains. The falls are really tall and there aren’t as many people swimming in the pool because it isn’t big and the undertow is strong. You can continue down beyond this to Beaver Falls and even down to the Colorado River. (I did that previously but we didn’t have time in this trip.) It is a really great trip to take with friends because you can hike, swim, or lay in a hammock and everyone can go at their own pace. There is a fresh spring at the campground to get drinking water. We only ate backpacking food and trail mix type stuff. I was missing fresh produce pretty badly but anything tastes good when you are hungry and tired. There are no fires allowed so camp stoves are needed. They don’t have trash cans so you are required to hike out all of your garbage. There are some decent porta potties throughout the campground. Most people who hike out either leave early in the morning or else hike out in the evening. Our plan was to helicopter out to save time. The helicopter only runs on a few specific days and there is a lot of waiting involved. We arrived at 8am and didn’t helicopter out until about 2pm. In the end it would have been a little faster to hike. Getting reservations is difficult. It requires making lots of phone calls until someone answers. They start taking bookings in February. Weekends are booked first so if you can go during the week its a lot easier to get reservations. We met a couple who didn’t make reservations at all and got their permits easily when they arrived. I wouldn’t recommend taking the chance but it is worth mentioning that people do it like that. first photo by @onemorejuju other photos by Paul Ferney for Oh Happy Day. that looks amazing! it think it sounds like it was worth all the trouble of getting there, right? where there a lot of people there? I hiked down into that canyon once when I was about 12. It really does live up to the photos! I hope you enjoyed your adventure; it’s a long trip, but definitely worth it. Thanks for sharing these gorgeous photos. Wow! Great shots! I especially love the last photo. Was it crowded at all? Are there better times in the year to go than others? I love love love this place. It is 100% worth the effort to get there. It will forever be one of the most magical places I have ever been. Thanks for taking me back! The waterfalls are HUGE! Looks insane! I hiked there in high school! INTENSE hike, but so fun! and the scenery is amazing! You’re the only other person I know that’s hiked there! What an amazing experience and lovely pics! I will never NEVER hike *out* while carrying my pack again! Once was enough for me. Those switchbacks at the end are no joke! And hiking through the sand is really hard. I have no problem paying for a mule to do the heavy lifting. But I do think it’s important to hike in and out…there is a lot of cool stuff that you’d miss if you were flying to the reservation. 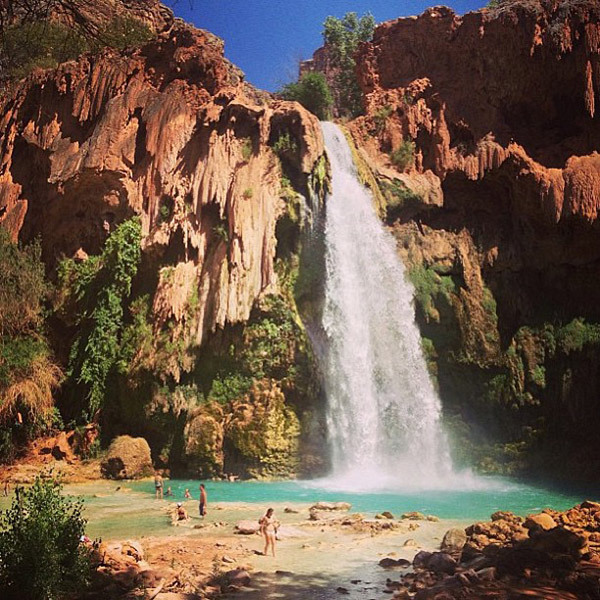 I was literally at Havasupai the weekend before last (June 7-10). Did our paths cross? I had never been before and, oh my, what an amazing beautiful place!! Love all your pictures. Maybe we did! It’s a small world. Sounds awesome, what would you do differently with kids? I would love to take mine there. This post inspired me to have my honeymoon here (when I get engaged that is ;)! ) what a wonderful spot and just so gorgeous.